Nobody could possibly be as much in love as these two darling snow people. That image is from QKR Stampede (Digi 21202 Snowman Couple and the sentiment is Digi 15116 This Much.) 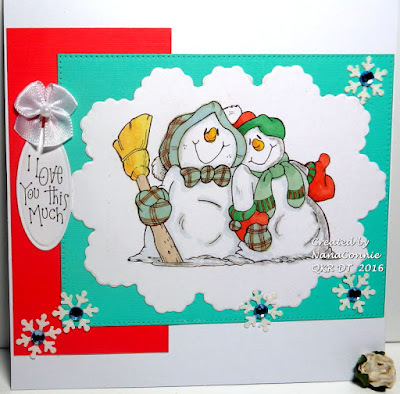 Our new challenge starts today and our theme is "Snowmen." 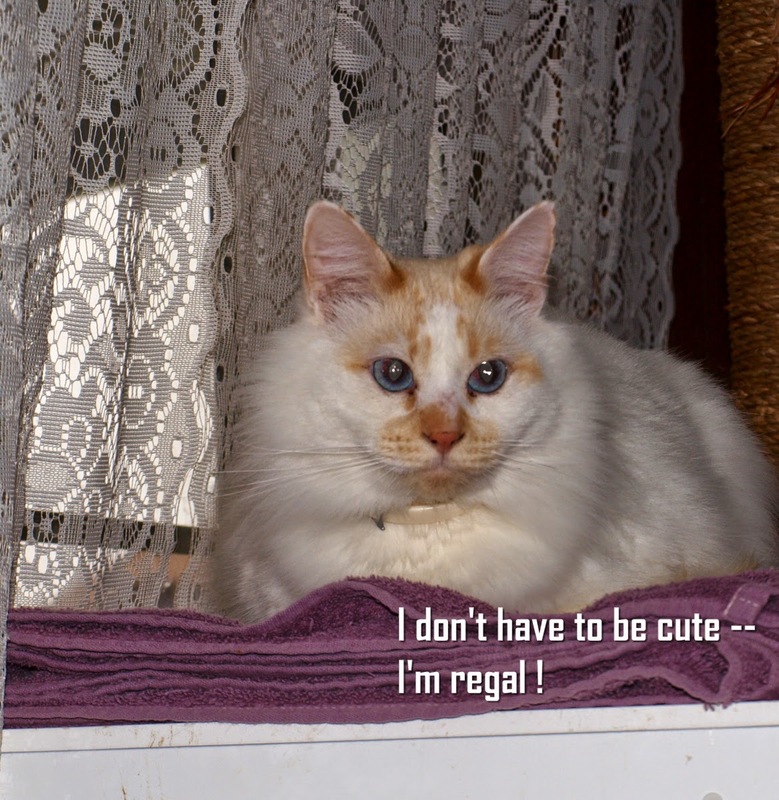 I did the coloring with Shinhan Touch Twin markers and then used a die from Sue Wilson to cut the image. 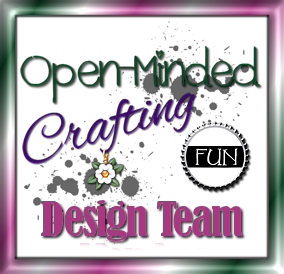 I mounted that onto a die cut Pinpoint Rectangle (a new die from Memory Box - hooray!) and layered that onto another rectangle. I printed and die cut the sentiment (Spellbinders Ovals) and added the hand-sewn bow and all the sparkly snowflakes for some embellishment. 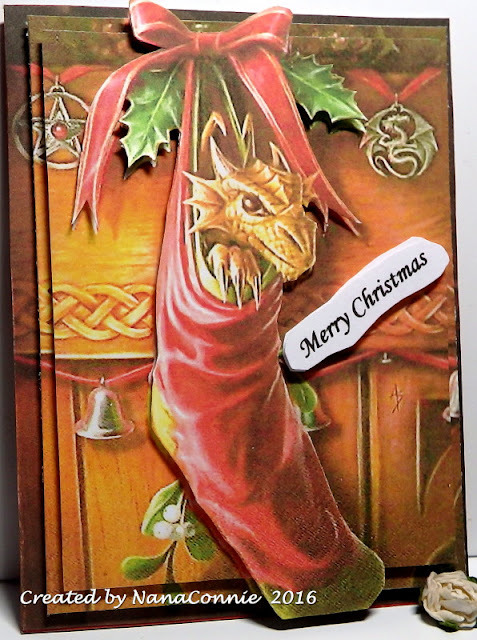 I have to share this one last Christmas card with all of you even though we're finished with Christmas for this year. 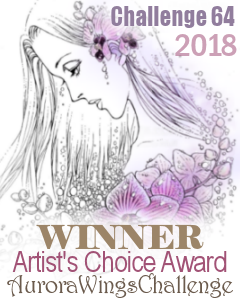 I just ran out of time to get this one posted to my blog before all the hustle and bustle of the holidays took over and started me running from place to place. I added the red and green Christmas twine (metallic), fraying the ends, and then added the single white flower for embellishment. The gem in the middle of the flower is red but looks black in the photo. 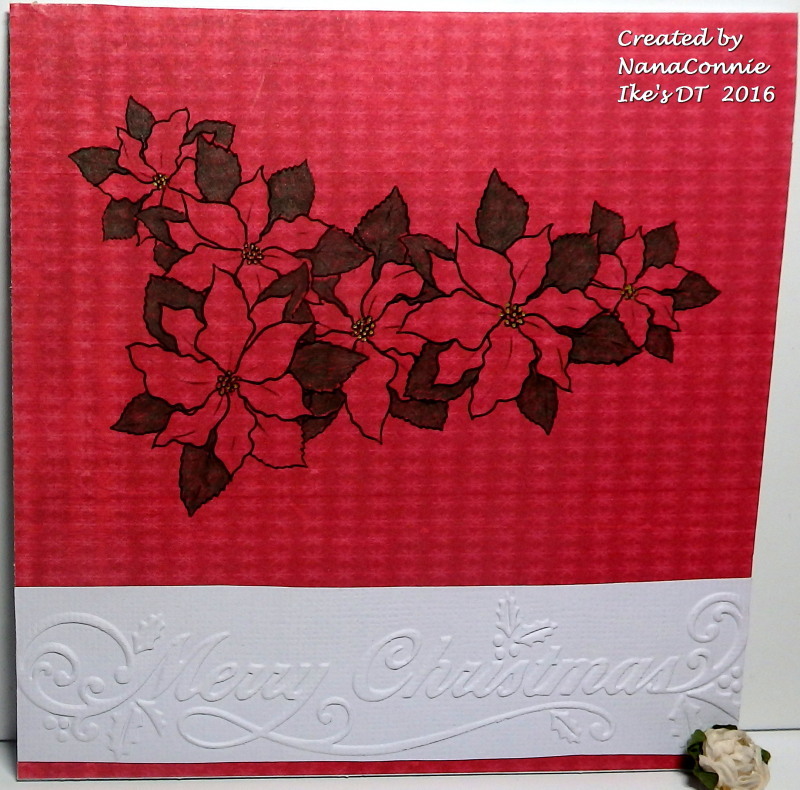 The flower is adhered on a Pop Dot for a bit of dimension on this otherwise flat, CAS card. I couldn't post this card until today because it's my first Granddaughter's Christmas card and she does check my blog now and then. I just didn't want her to see it before today. Since she adores dragons, this will thrill her to pieces. Merry Christmas to all my friends and followers. 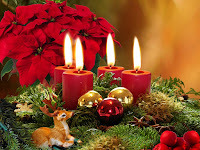 May the blessings of the season be yours. 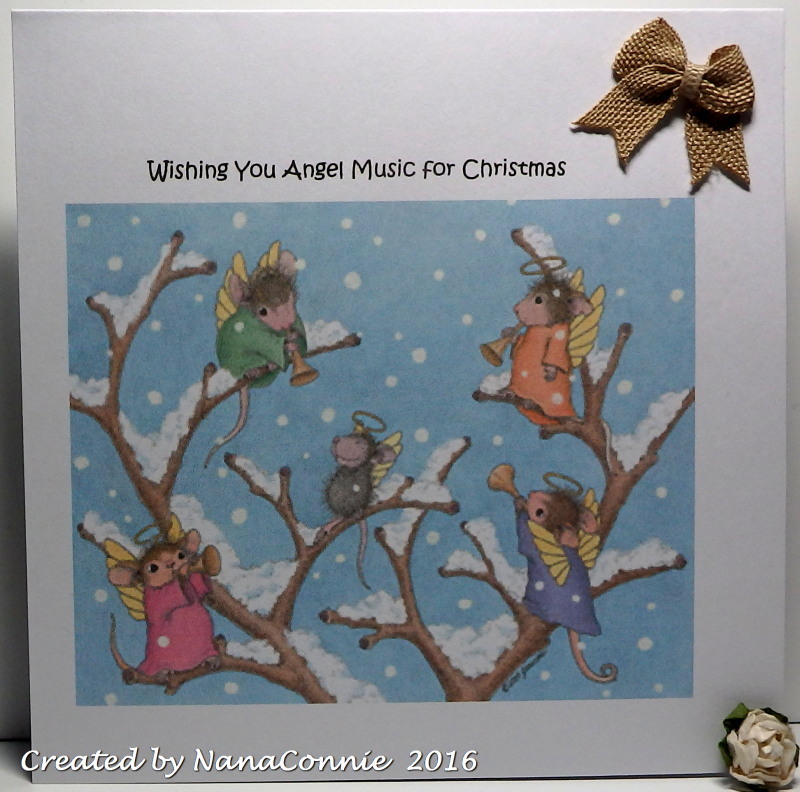 It wouldn't have been Christmas at our house without a House Mouse card or two and since I have a dear friend who adores angels, she got this one. I decided on a very CAS design since I had to mail this one. 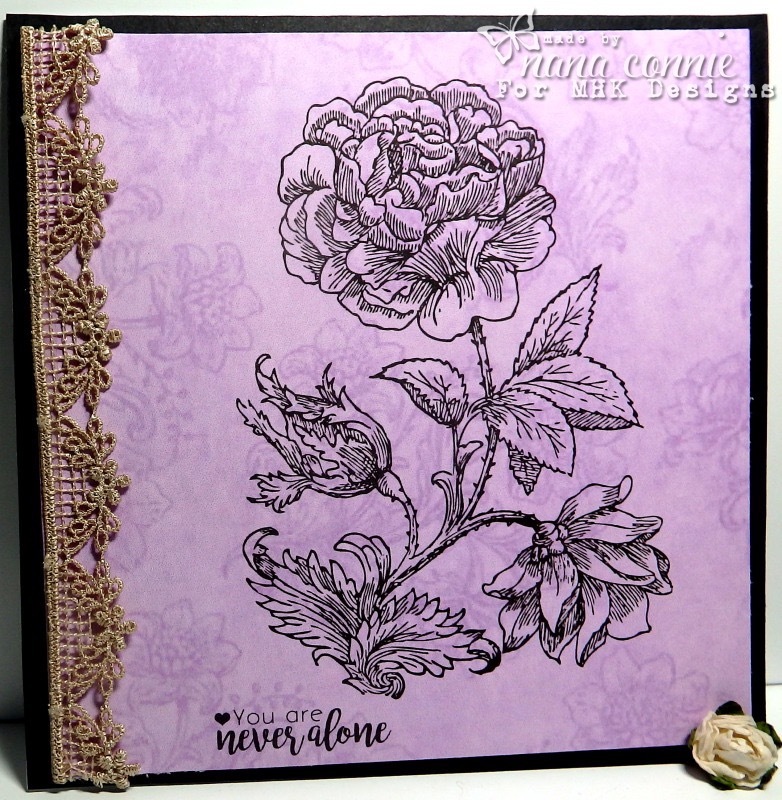 Colored with a combo of ProMarkers, chalk, and white gel pen, I then cut the image with a rectangle die from Spellbinders. 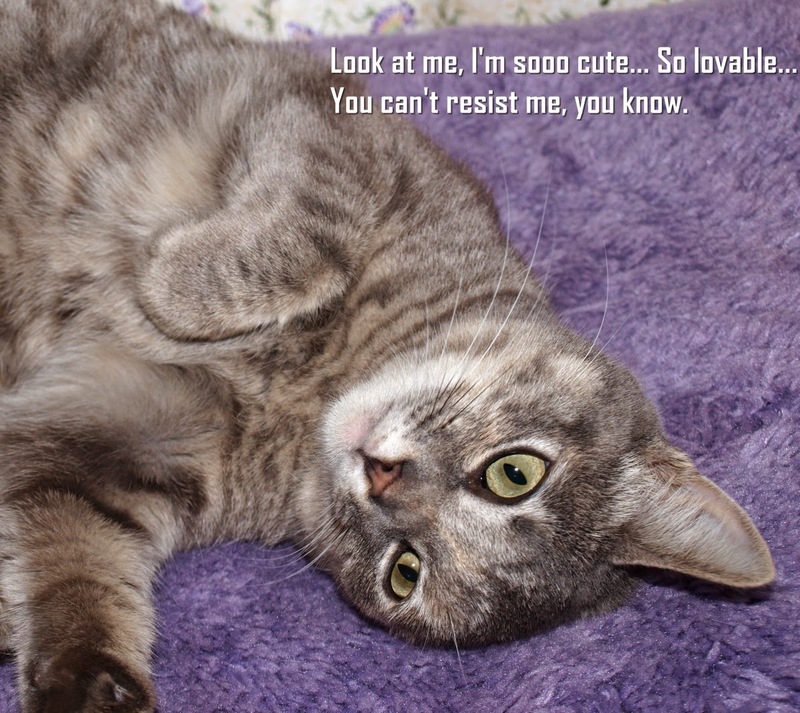 The sentiment was printed onto the card front before I added the image. I used one small, burlap, bow for embellishment but it's pretty flat so it was still easy to get the card into the mailing envelope. Friday, tomorrow is Christmas Eve, and we have another challenge that starts today at QKR Stampede. Our theme is "Santa" and we're all waiting to see him with his sleigh and reindeer. However, I want you to know that there are secondary arrangements made just in case the reindeer get sick or refuse to fly on Christmas Eve. 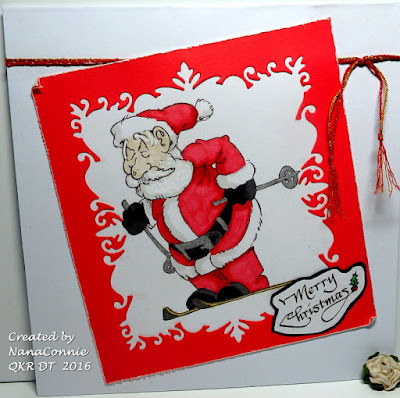 Here's evidence that Santa is a master on the skis although he may be running late to those areas without snow for Christms! I used Digi 16702 Santa Skiing and Digi 8717 Merry Christmas; colored the image with my Copics (because they have the best reds of any of the alcohol markers) and then used a red CS frame, die cut with a die from Impression Obsession. The frame is actually something I would normally have thrown away after cutting another very intricate piece, but I was working on more than one card that morning and, as I looked at the outer frame piece, I saw that it could be used to frame the Skiing Santa so I distressed the edges, layered it on top of the image and made a tiny curl on one corner. I added the two bits of sparkly twine, one red and one gold, and tied them together in the upper corner. 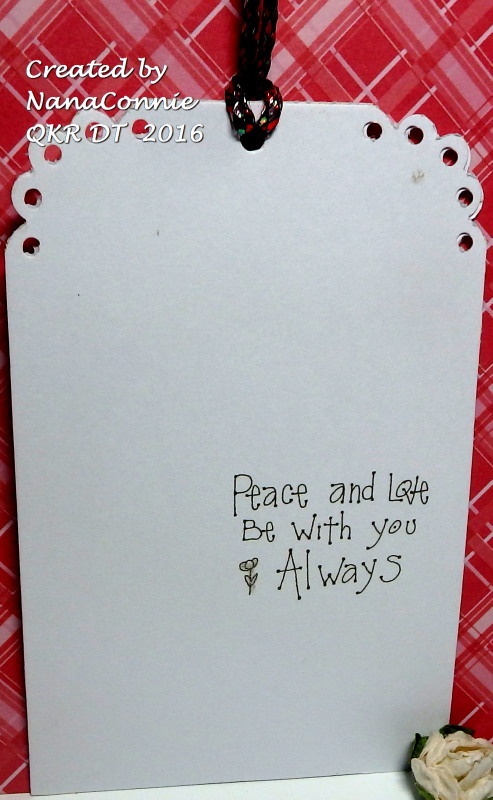 I added the hand-cut and matted sentiment, then left it very CAS so that it can be easily mailed. It makes a great masculine card. 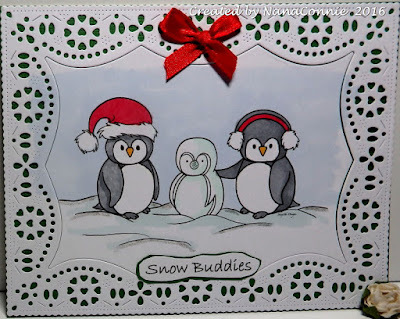 I used my ProMarkers and Copics to color the image, added some glitter to the snow and snowflakes, then die cut it with stitched dies from Die-namics. 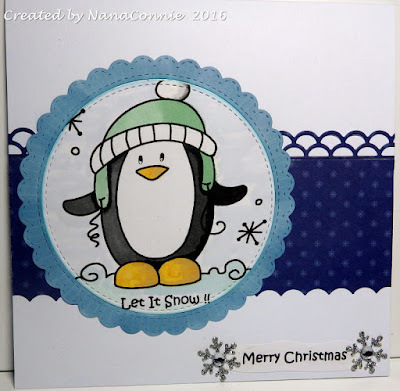 The snowflake border was cut with a die from Tutti. 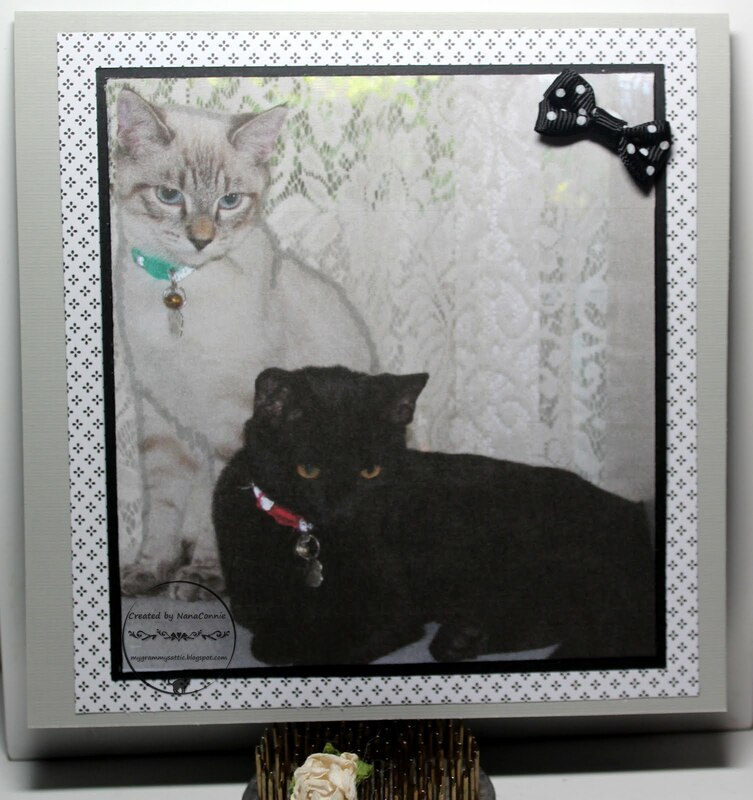 The light blue frame and the image are mounted on Pop Dots to give some dimension. The bow is one of those I make by the dozens and toss into my stash for future use. 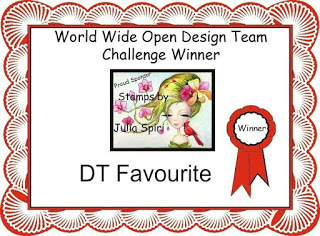 Today starts our latest challenge on the Facebook page of Sheepski Designs and we'd love to see you play along. 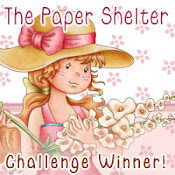 The winner of last month's challenge will also be announced today so be sure to check. 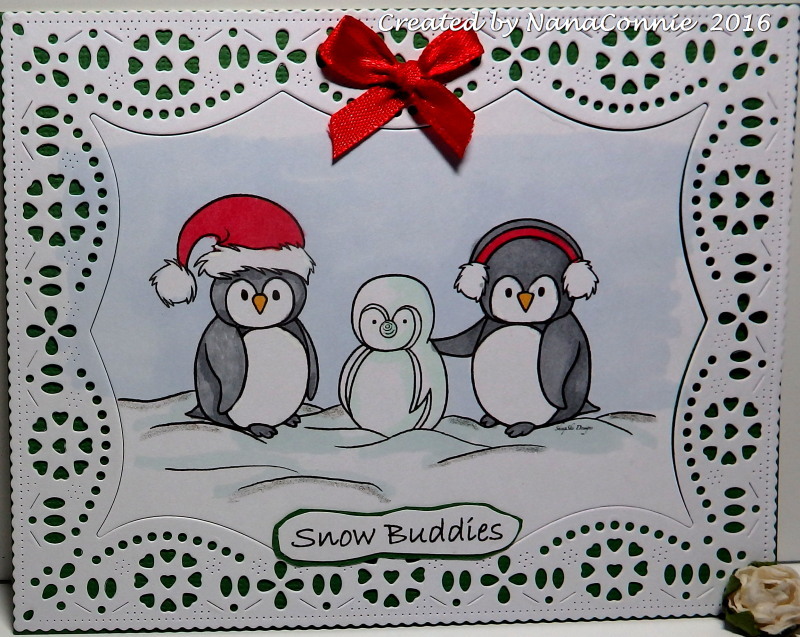 My inspiration card uses Andrea's darling "Penguin Pals" and they are a real joy to color. 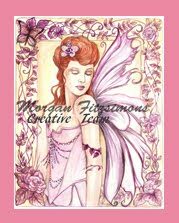 The image is colored with ProMarkers and cut with a die from Cheery Lynn. The frame is part of the same die. I mounted it on top of green CS and added the sentiment and the hand made bow. Hello to all of you on a wonderful Friday morning! 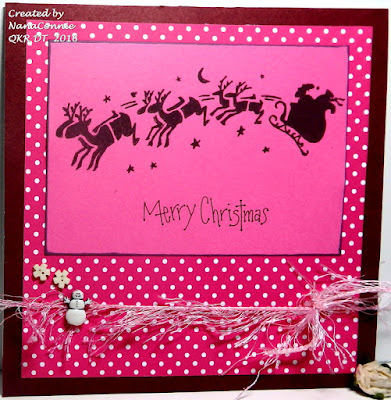 There's a new challenge starting today over at QKR Stampede and our theme is "Christmas Cards." 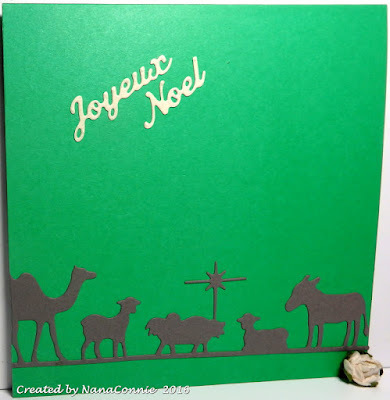 I know most of you have been making Christmas cards at least this whole month, but for those of you who aren't yet finished, this is another opportunity. I actually combined two QKR images for this one, adjusting the sizes as needed; Digi 13812 "Special Delivery" and Digi 13714 "Christmas Mouse." 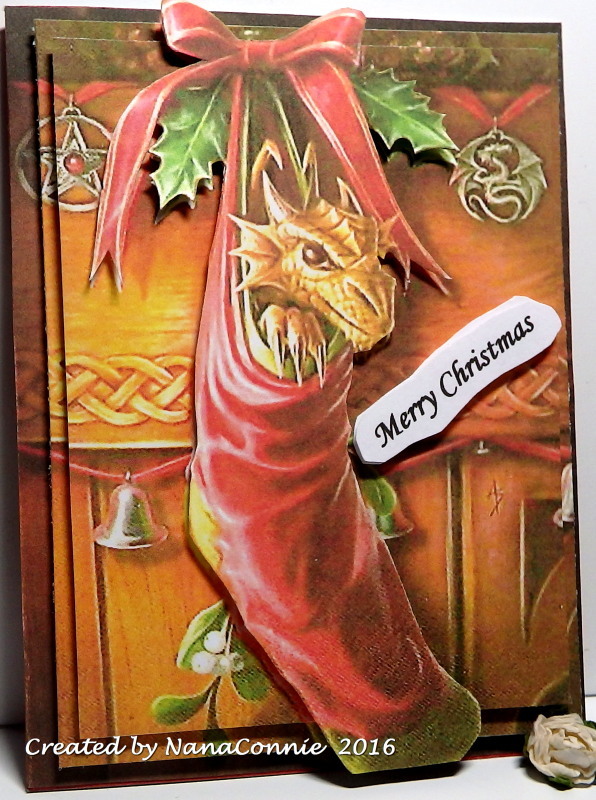 I colored the elf with my ProMarkers and glitter (on the bell and the package ribbon.) The mouse is a silhouette stamp so I only added a bit of red to the ribbon on his package. 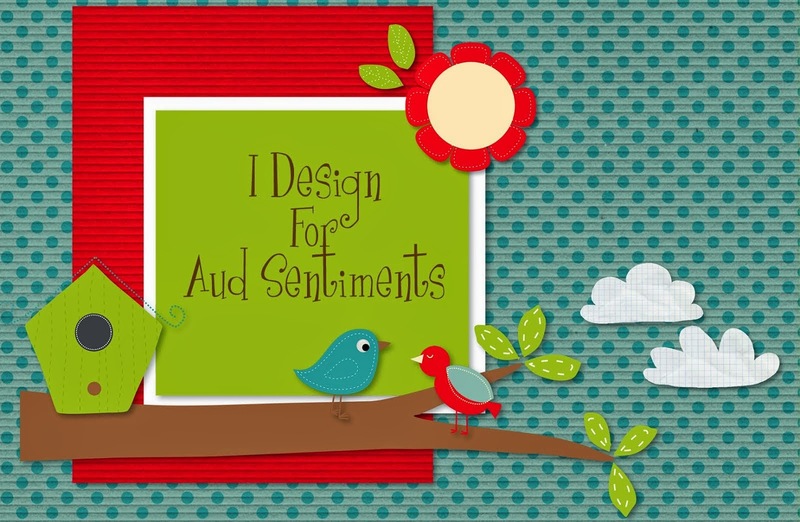 The sentiment is my own, printed and cut with a flag die (Spellbinders.) 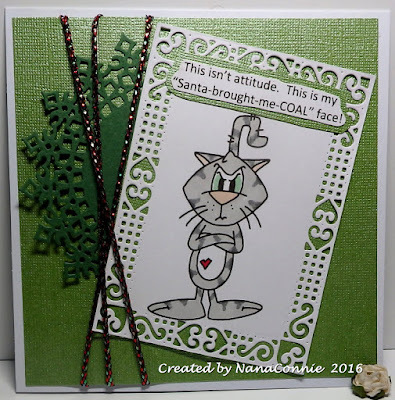 Again, I stayed with a very CAS design for this one and will no doubt use it as a masculine card since I have far more men on my Christmas card list than women. I think this is one of my favorite Christmas cards this season! Talk about CAS and quick - I've done more than two dozen of them, all in various shades of red, green, and neutrals. The die cuts were done with dies from Die-versions. Although it's hard to see in the photo, the sentiment is glittered and sparkly. All the die cuts were made from leftover scraps and snippets - a really good way to use up the scraps instead of just filling the trash can with them. Sometimes you have to move and adjust them so that the die will fit but it's worth it. 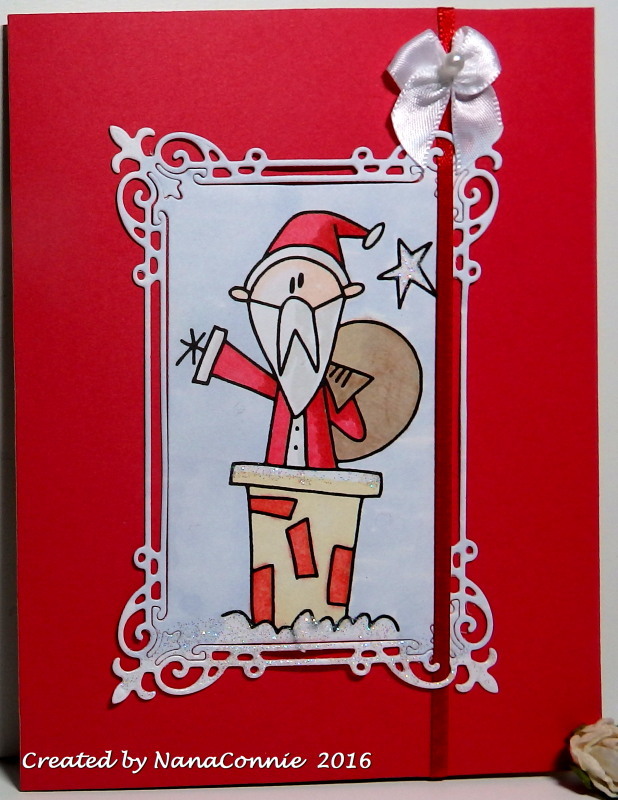 I used Sakura Quickie Glue (in a pen) to adhere them to the card front. Including the cutting, it took me less than 15 minutes to do the first one. After that, I did all the cutting at once and then just set up the assembly line to get them all glued. These are being donated to a Senior Center near me so that those folks will have cards to give to family and friends. 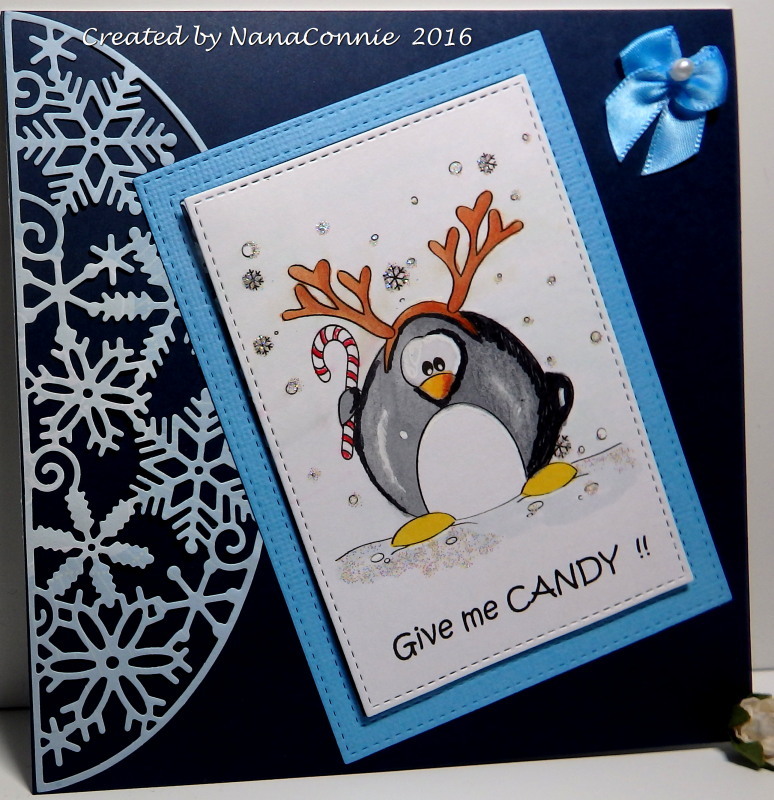 I fell in love with this darling little koala bear from Sasayaki Glitter, an image for their Progressive Challenge. But are there really snowflakes in December anywhere in Australia? This was a really fast design to put together. 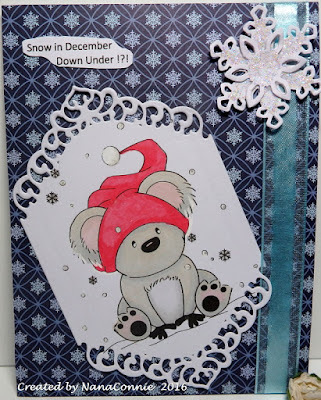 I colored the koala with ProMarkers and added a bit of sparkle to the snowflakes in the image with a glitter pen. I die cut him with a die from Spellbinders. I also cut the snowflake layers, added loose glitter to them and glued them together to make the snowflake embellie. 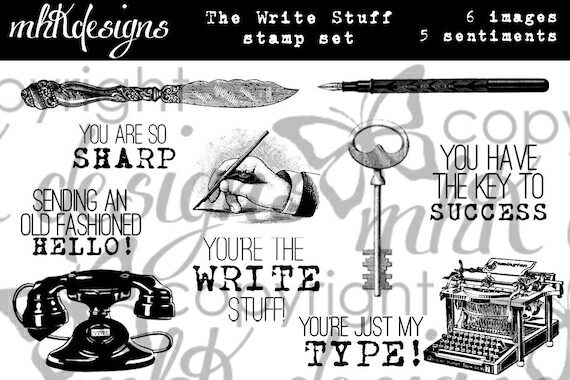 Here we are on the 5th and final day of the December release over at MHK Designs and I do believe this one, "The Write Stuff" set, is my favorite of all the sets this month. Of course, I probably felt that way about each of the sets as I was using them. :-D You can see a photo of the entire set at the bottom of this post. 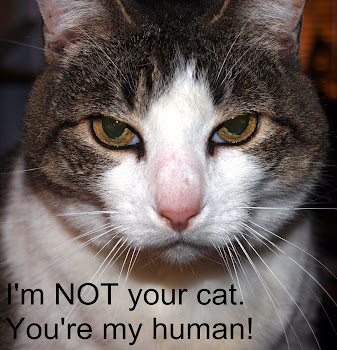 There are so many images and sentiments! 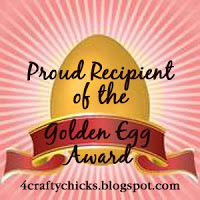 Here's the one I chose for my card. I wanted a totally masculine card this time since I'm going to be using it as a birthday card for a friend who has a Christmas birthday. 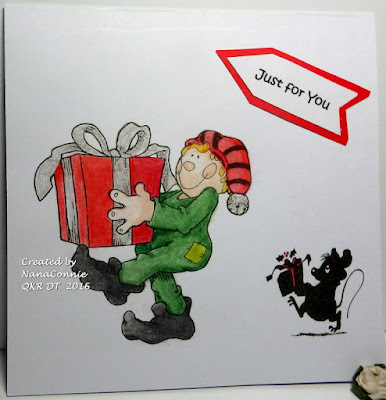 I like to make two cards for him each year so that his birthday doesn't just get lost in the holiday. I used pale blue chalks to color the hand and the background shading, then I cut it with a plain rectangle die (Spellbinders.) 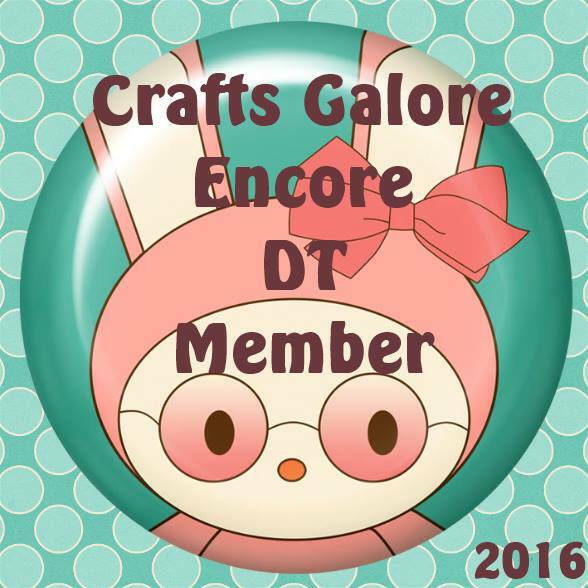 The frame was a leftover from another die cut project (Bo Bunny) which I trimmed to fit the rectangle. 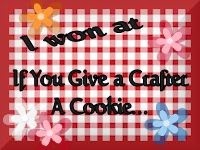 I added texture mesh and ribbon to the background, added the image and the sentiment, and then tied the bow. 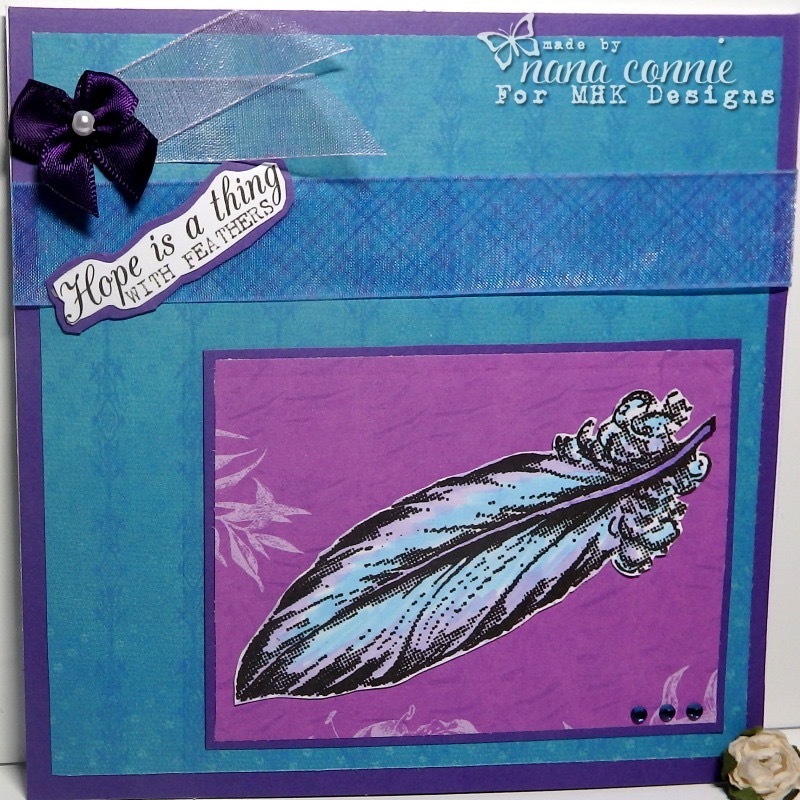 This is the fourth release from MHK Designs for December and it's called "Fanciful Feathers." I've added a photo of the complete set at the bottom of this post. 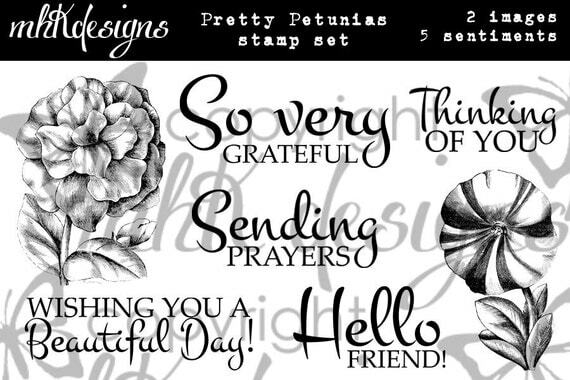 I love the sentiments included in this set! Of course I had to use my favorite color combo, turquoise and purple. I colored the feather with chalks and fussy cut it. I mounted it with dimensional dots onto some lovely purple dp from the MHK Designs set of papers, "Easter Flowers." The turquoise paper is from that same set. I printed and hand cut the sentiment, and everything is matted with purple CS. The ribbons are from Really Reasonable Ribbon and the bow is one of those I make up by the dozens but it was white and I used a ProMarker to "dye" it. 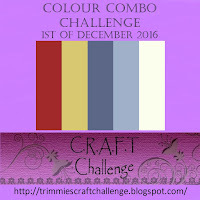 Don't forget there's still almost a week to play in our November/December challenge, which runs through December 15, and which has a lovely inspiration photo. There is no December/January challenge since Mynn is giving time off to the DT so they can celebrate the holidays with their families. It's Friday morning and a new challenge has begun at QKR Stampede. 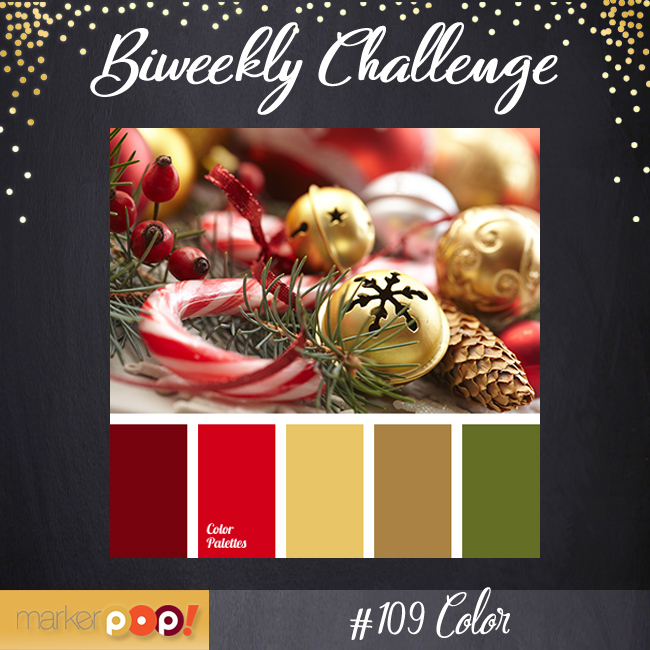 This week, we want to see you do something Christmas but in "Non-traditional Christmas colors." I chose the brightest pinks I could find! The image is a wonderful silhouette, Digi 15705, Sleigh and Reindeer and the sentiment is Digi 13806, Merry Christmas. I printed both the image and sentiment together onto pink CS, and used a black ProMarker to ink the edges of the die cut rectangle. I layered the image piece onto bright pink, polka dot dp, and mounted that whole thing onto burgundy mulberry paper. I found the snowflake and snowman buttons in my stash and added them, along with some pale pink fibers as the embellishments. I decided to use somewhat vintage shades of the traditional Christmas colors since I've just done so many traditional Christmas cards this week. I used my ProMarkers to color him and found a Cheery Lynn die to cut the red frame. The polka dot paper was in my stash and I think it's from SU. 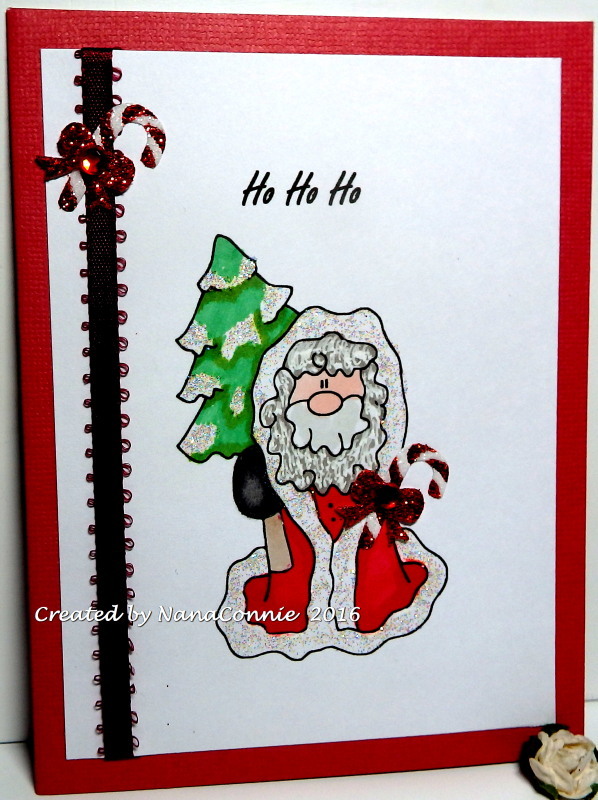 I added the 3 green candy canes for a bit of sparkly embellishment. 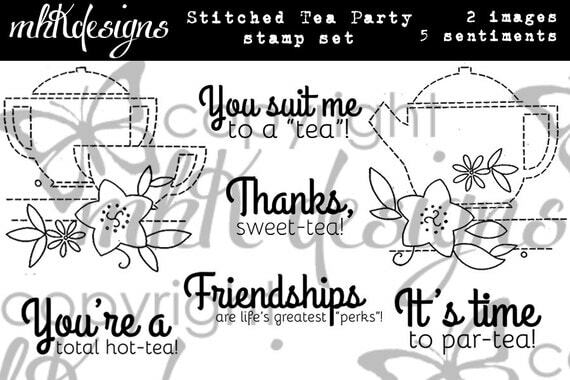 Here it is Day 3 of the December releases at MHK Designs and today we're featuring projects using images and sentiments from the "Stitched Tea Party" set. I love this set! So versatile and the sentiments are fun and friendly. There's a photo of the set at the bottom of this post. 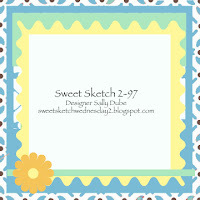 To 'color' the image I used papers from the "Get Well Flowers Papers" set and from the "French Country" papers set. 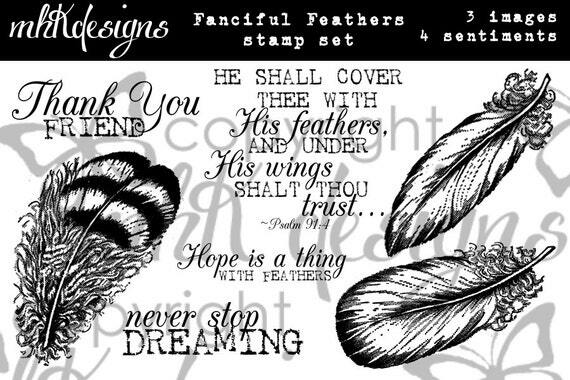 Of all the digital papers at MHK Designs, these are two of my all time favorites. I did add glitter to the center of the purple star flower and the little daisy on the teapot. 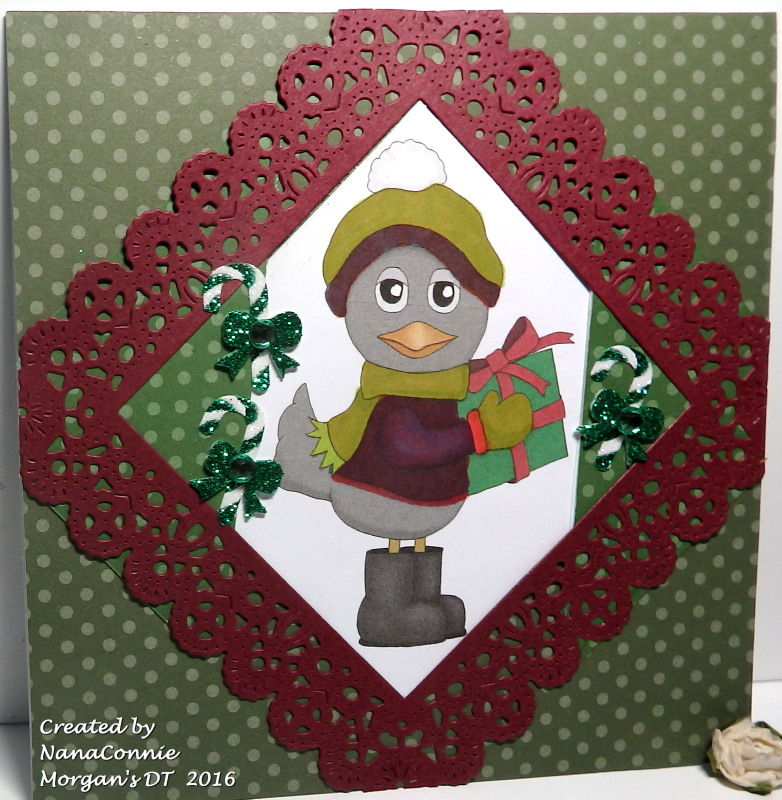 I cut the image and the green mat with a Stitched Circle die (Memory Box) and layered them in an offset design. The sentiment is also cut with a die from that set. 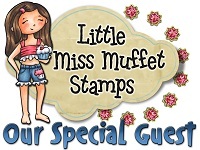 I added the five little rhinestone flowers for embellishment but beyond that, left it clean and simple for easy mailing. 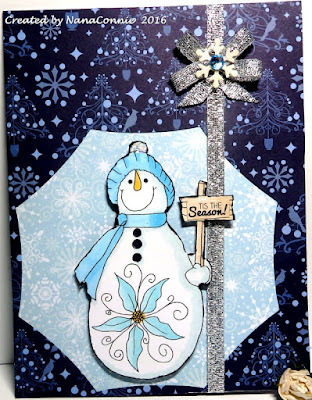 This card has clean snow (with white glitter on the snow and the star) and it's another of my CAS designs. 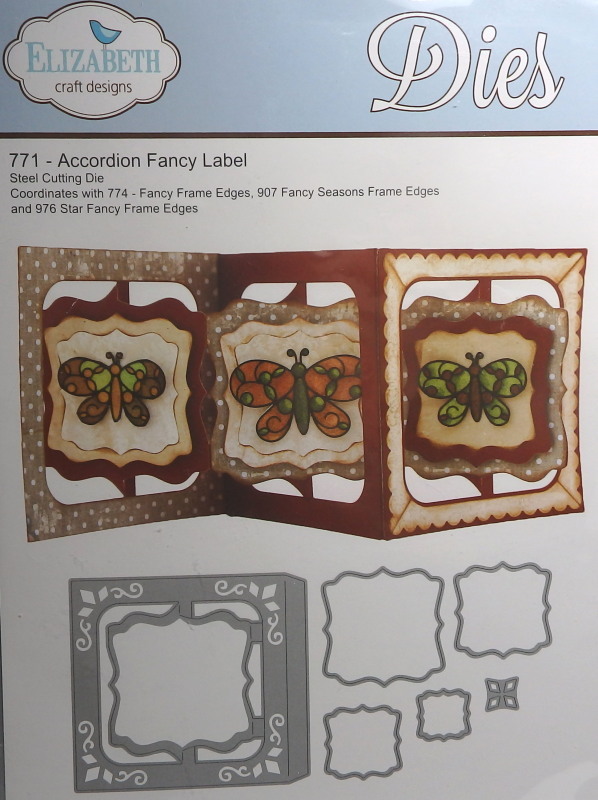 It has a colored image (ProMarkers) which was die cut (Bo Bunny), an embossed frame (also Bo Bunny), a thin strip of ribbon, and a handmade bow for embellishment. 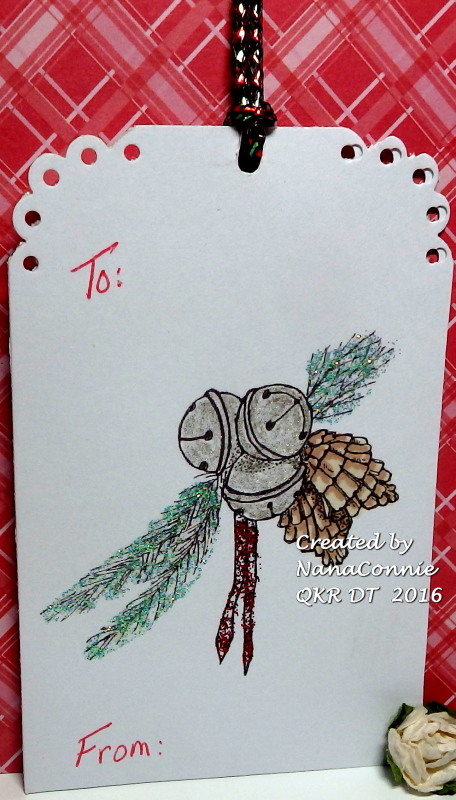 Here's another Bugaboo card and this one is done for the Catch the Bug Holiday Chaos, Day 5 - "Humor." I started with the sketch from Outlawz. I dearly love all the Crab Cat images and this one isn't actually intended to be a Christmas image but I was pretty sure it would work as one with that sentiment I made up and with traditional red and green colors. He's colored with ProMarkers, and die cut with a die from Cheery Lynn. 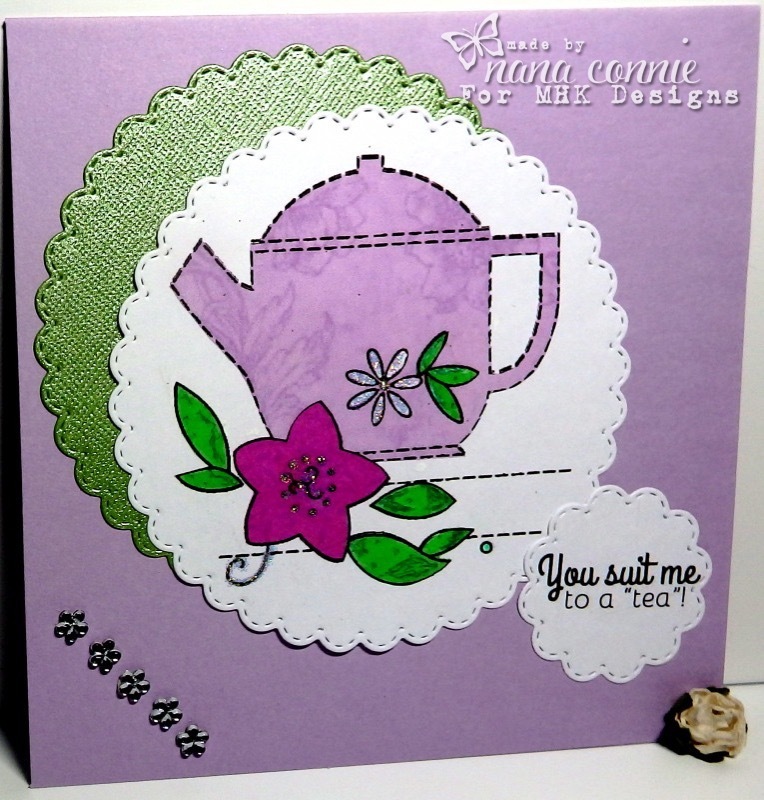 The doily is also a Cheery Lynn die cut. The twine has been in my Christmas stash for nearly 3 years and I decided it was time to use some of it. I said they were being posted out of order but this is my card for the Holiday Chaos Day 1 challenge at Catch the Bug, "All that Sparkles." I've already shared the card for Day 2. 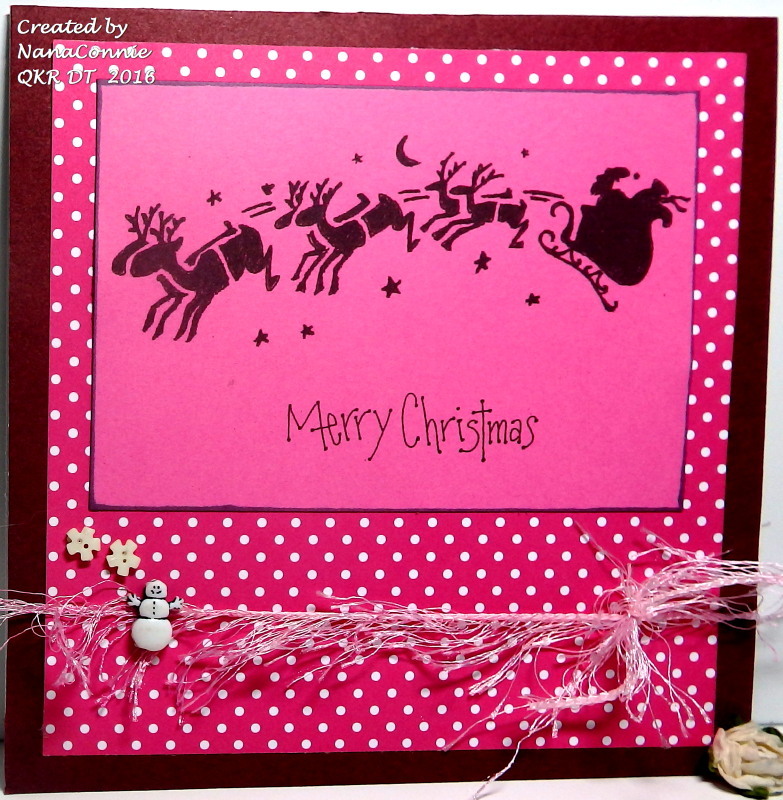 I used one of the sweet 'Old World Santas' from Bugaboo Stamps for this really CAS card. 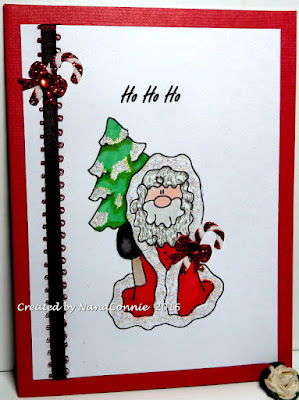 I printed the santa and the sentiment onto the same piece of scrap CS, then I colored it with ProMarkers, colored pencils, and lots of glitter on the tree and fur on Santa's coat. Pretty simple with just three colors; red, green, and white. 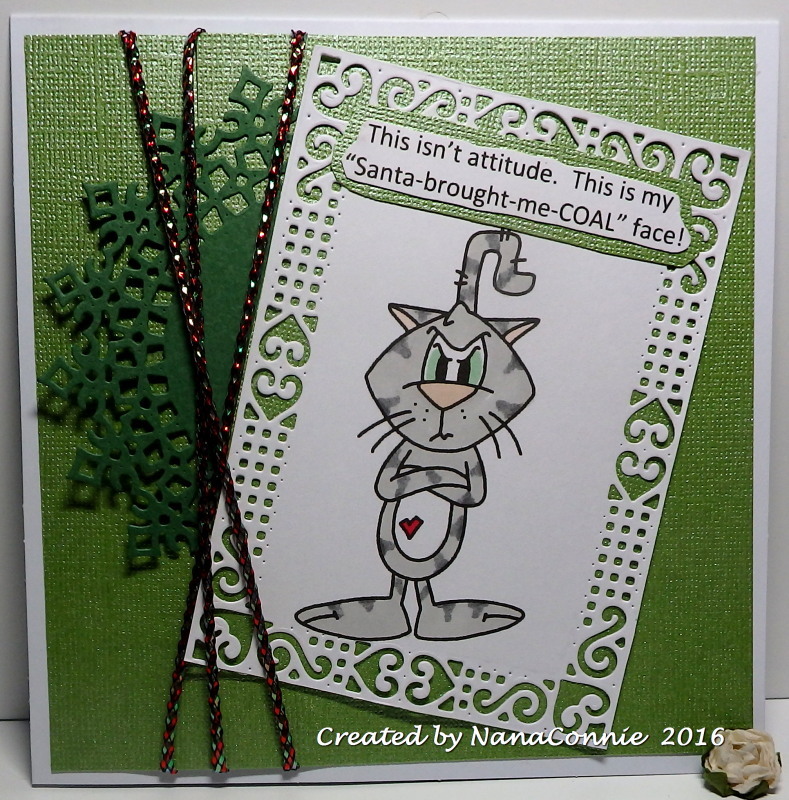 I cut it into a simple rectangle, added ribbon, and put it on the front of a red card base. 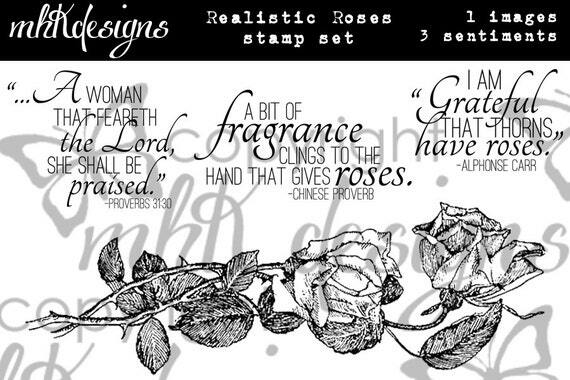 This post features the "Realistic Roses" set from the second of the December releases at MHK Designs. I love these roses! I've added a photo of the complete set at the bottom of this post. The sentiment and the roses are printed together and I colored this one with my ProMarkers and with gel ink pens for the highlights. 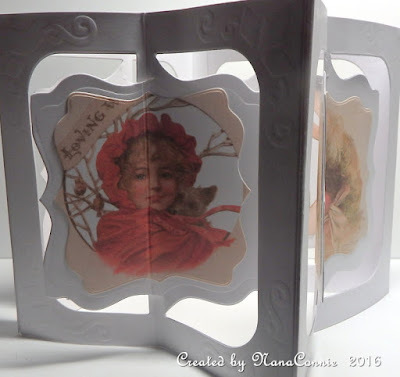 You'll notice that I flipped the image before I cut it with a simple rectangle die from Spellbinders. 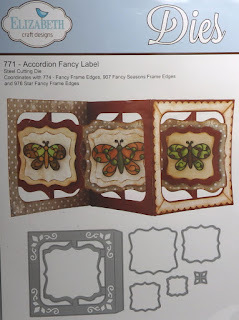 The framing die cut is a piece left over from another project and the die set is called "Enchanted Forest" by Cheery Lynn. It was such a perfect fit! 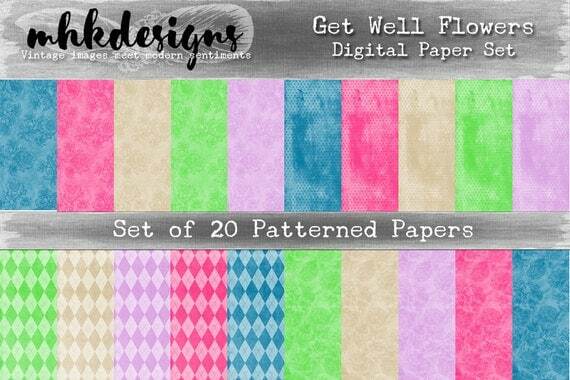 The papers are from the "French Country" and the "Get Well Flowers Paper," both of which are from MHK Designs. The flower embellie layers were cut from inked watercolor paper, run through an embossing folder, then sprayed with water so they would curl. After they dried completely, I layered them together and added gem brads to hold them. 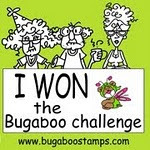 I love Bugaboo Stamps and love playing in their week-long celebrations which they do in July and again in December. I know I'm doing these a little bit out of order but I'm not going to be able to play in each of the 7 days of their Catch the Bug Holiday Chaos challenges anyway so I don't know that it really matters what gets posted on which day. 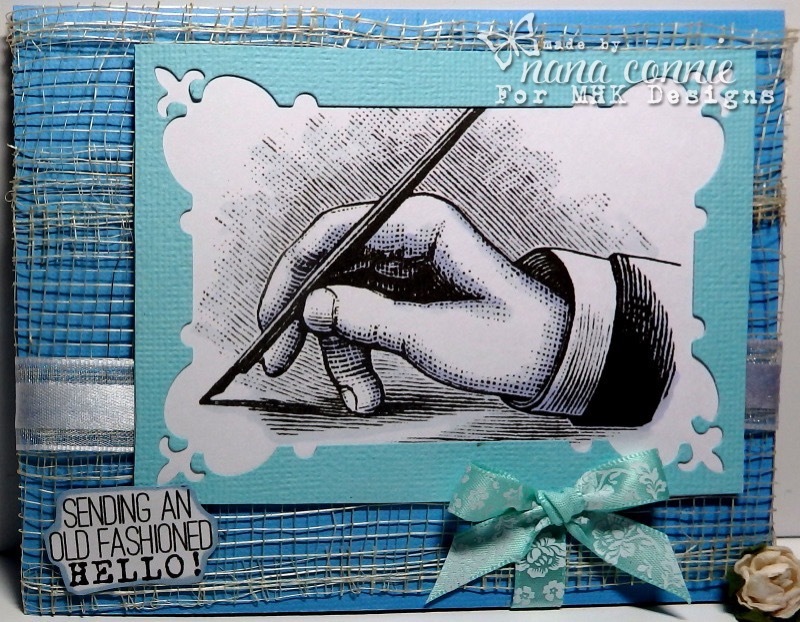 This card follows their sketch challenge for Day 2. Colored with Copics and ProMarkers, then cut with a stitched circle die from Memory Box. 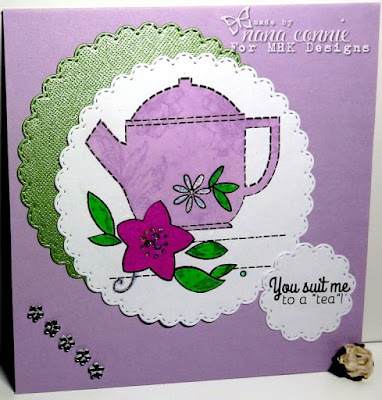 The Stitched Scalloped die is by Die-namics. The scalloped border (both top and bottom of the dp) was cut with a die from Cheery Lynn. I added the sentiment and two silver snowflakes for embellishment. For those of you feeling the chill of snow blanketing your yards and steps, how about a peek at a beautiful new release from MHK Designs that will bring on thoughts of spring? The set is called "Pretty Petunias" and there's a photo of the full set at the end of this post. 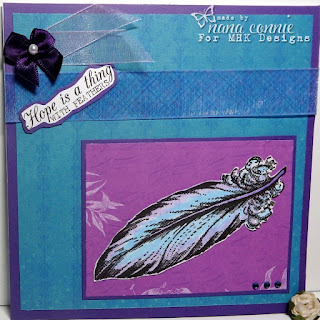 I colored with chalks this time and cut the image with one of my newer die sets from Spellbinders. 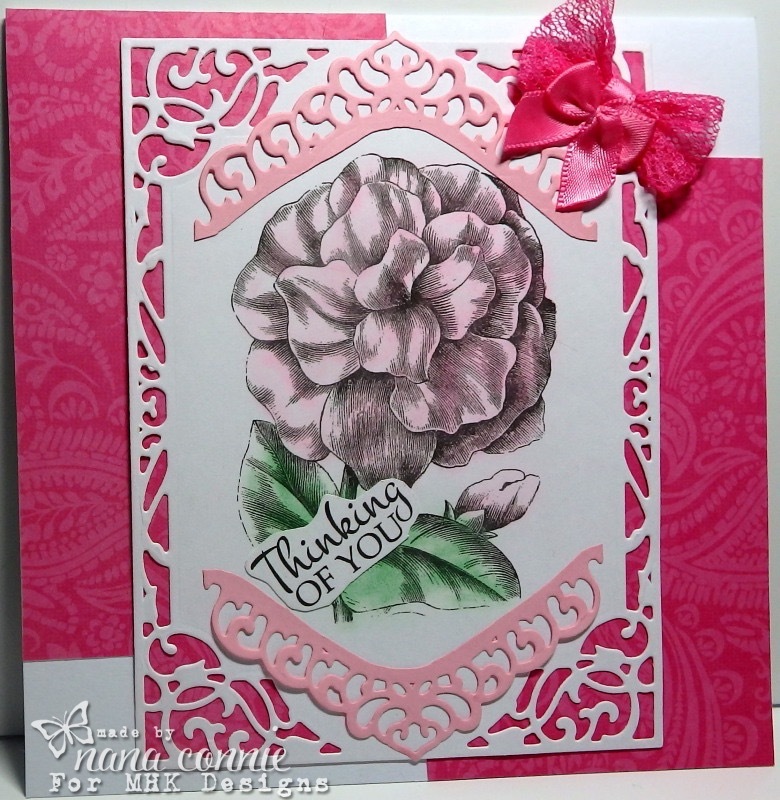 I added light pink "negative" scraps from another die cut (same set of dies) to add to the framing of the petunia. The bow is a double loop made from lace and satin ribbon with a tiny pink button in the center. 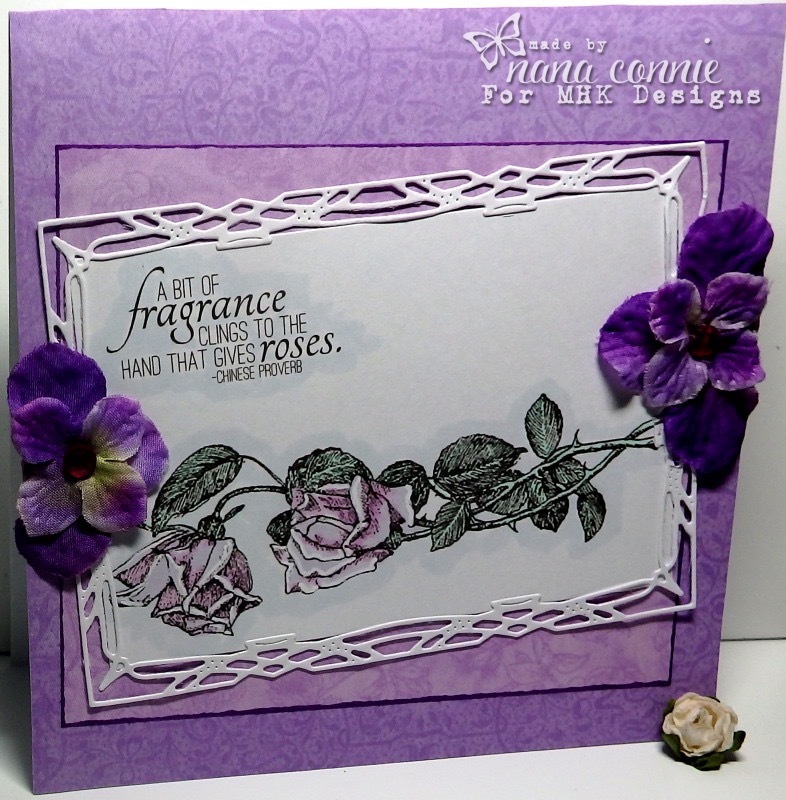 The sentiment is part of the Pretty Petunias set. Today we start a new challenge at Ike's World and our theme is this beautiful photo inspiration. Let us know what inspired you. I was moved by the florals and the red colors and used Ike's "Poinsettia Cluster" image. I printed the image directly onto some digital paper, then colored the leaves with ivy green ProMarker. The green ink on the red paper made the leave look almost black gave it the feel of a silhouette image. I added gold paint to the centers of the flowers with a teeny-tiny, spotter brush. I cut a strip of white CS and used a Darice embossing folder to do the sentiment, then added it to the bottom of the card front. This is a very Clean and Simple design which will mail easily. Today starts another Advent Calendar day at Kit and Clowder, which today is sponsored by Sheepski Designs. 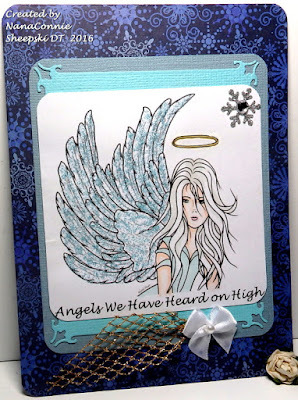 The angel on this card (Angelica) is a freebie which you can get if you're a Kit and Clowder and Sheepski Designs member. See the instructions on the Kit and Clowder Facebook page for downloading it. As a Sheepski DT member, I had the option of participating and once I saw this gorgeous angel, I jumped at the chance! I colored her with my ProMarkers but her wings are 'colored' with Baby Blue Stickles, something I've never tried before. 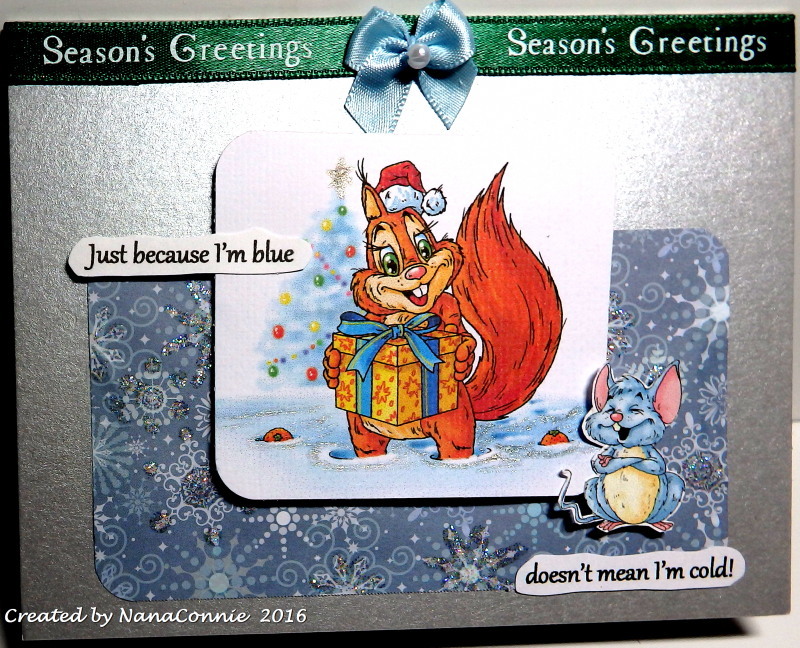 I really love the overall effect of the soft blue and the sparkle, plus it gives some interesting texture. 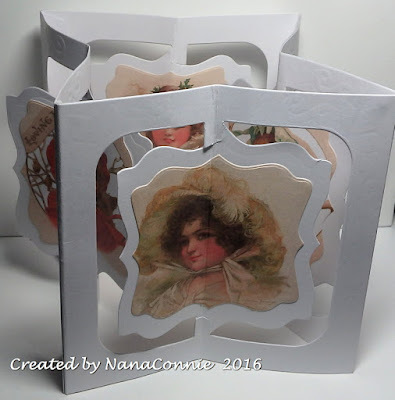 I used dies from Spellbinders and Memory Box and the dp came from some leftovers on my work table. I added a handmade bow with a pearl, some sparkly netting, and a jeweled snowflake. I just love the combination of silver and blue for this card! I tried something completely new today and I love the result, although it's extremely difficult to photograph. 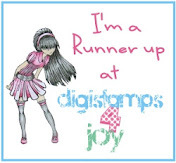 A couple of months ago, I was lucky enough to win a new die set from Pixie's Snippets Playground. Here's a photo of the die. Although the die is intended to be used to make accordion cards, I used it to cut 4 sides of a Victorian Christmas ornament made to stand on a table or mantlepiece. The best part is that it will fold flat for mailing or storage. I printed four different vintage girls, printing each one twice, so that I could add them to the swing flaps, both front and back. The overall size is about 5.5 inches square on each side. 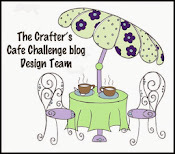 Color scheme is for the challenge at C.R.A.F.T. I'm so frustrated with trying to photograph glitter and sparkle that I'm nearly ready to throw away my digital camera. I added sparkly glitter to the snowflake paper and sparkle gel ink to the tree and snow in the squirrel image and you can barely see it ! Of course, the glare from the metallic silver paper doesn't help but there was nothing I could do to get rid of that, no matter how hard I tried. A new Progressive Challenge has started at The Outlawz and the image this month was provided by Sandi's Samples; this darling little snowman who was just crying out to be done in monochromatic blues. I used my ProMarkers to color the snowman, then fussy cut him. I printed a different sentiment (his sign originally said "Chill!") and layered it onto the front. I mounted the snowman on dimensional dots and he just pops off the paper. The papers are from DCWV and I chose similar yet different dp patterns in two different shades of blue; the darker one has Christmas trees and snowflakes and the lighter blue has just snowflakes. 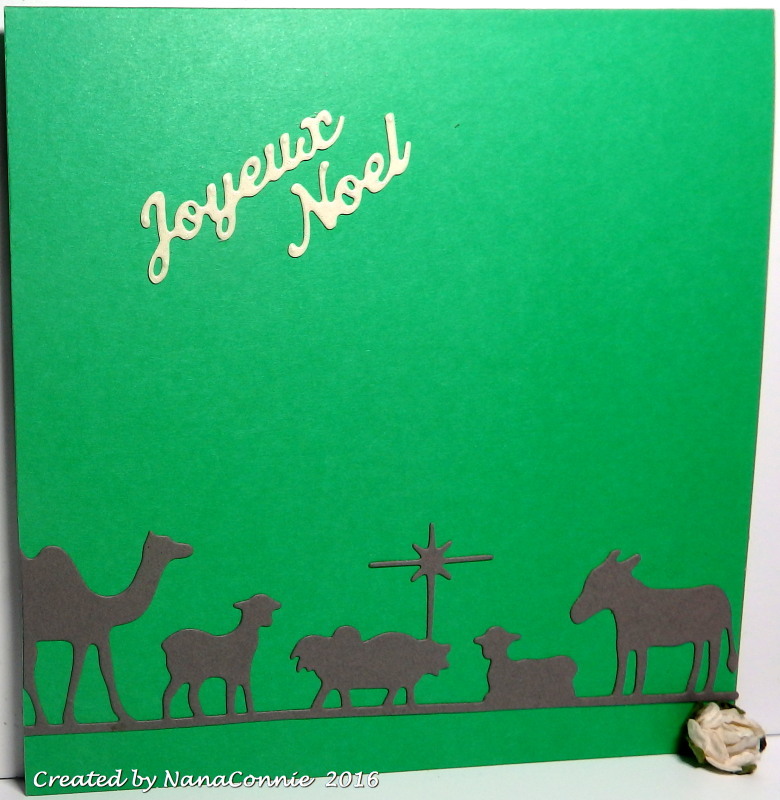 Believe it or not, it's the darker paper which is die cut (Spellbinders.) I layered it on top of the lighter blue paper. I'm using up leftover negatives again. 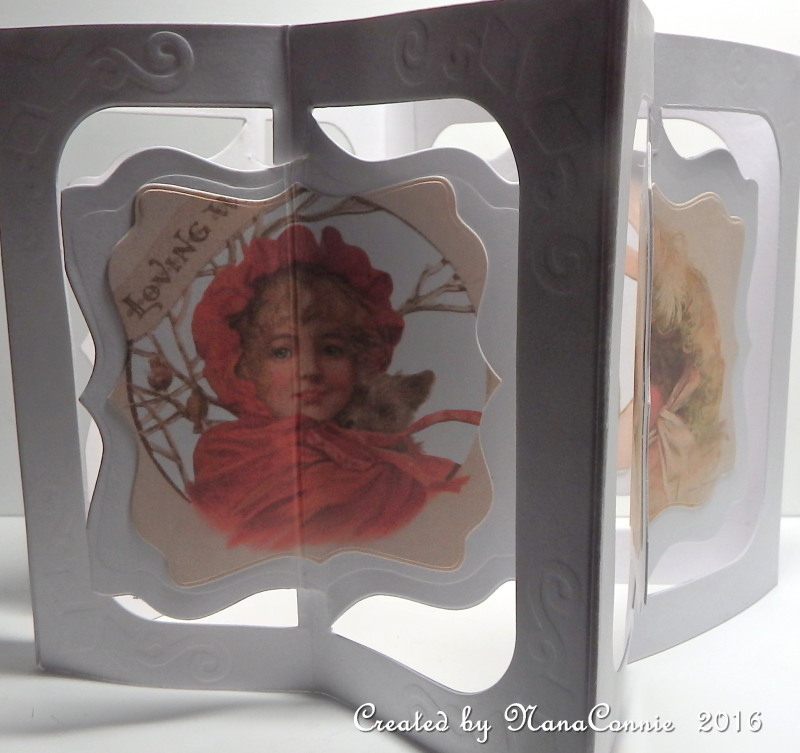 The silver ribbon was in my stash and seemed perfect for this card design. I made my bow into a snowflake shape and then added a gem snowflake for a touch of embellishment. I put a tiny bit of glitter on the top of snowman's hat. 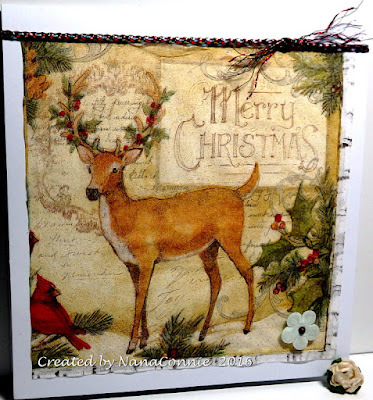 Friday always means that a new challenge is starting over at QKR Stampede and our theme this week will help you get your "Christmas Tags" done. I don't know why these are always the last things I get done each year when they are so simple and fast! But here are a couple I managed and more will follow, I'm sure. The first one is done with Digi 15702 Pine Sprig and the second uses the sentiment Digi 14804 Peace and Love. The Pine Sprig is colored with Shin Han Touch markers, enhanced by Lyra colored pencils, then I added glitter to everything but the pine cones. 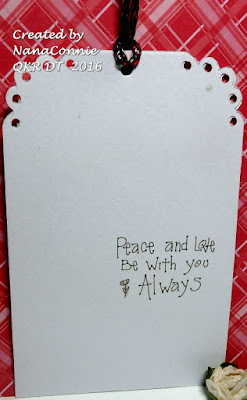 The sentiment is printed onto a scrap of white CS and both of the tag shapes are cut and punched. I added the sparkly jute cord and called the project finished. 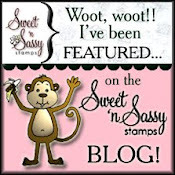 If you've arrived here from Lorie's blog, you're in the right place. 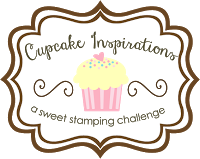 For those of you who just came here without knowing about the special blog hop, you'll want to start on the main MHK Designs blog so that you don't miss anything. 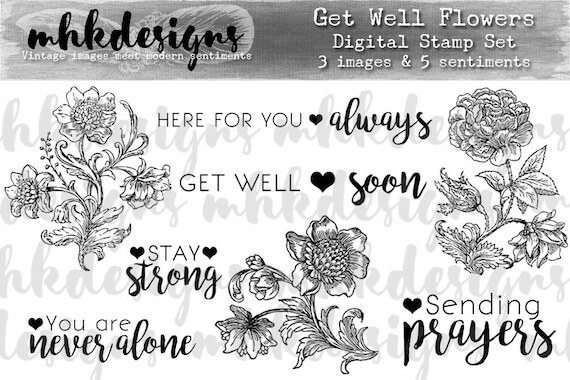 Along with this hop, there is a special release digital stamp set, called "Get Well Flowers" and paper pack called "Get Well Flowers Papers" from the MHKDesigns Etsy shop, each designed specifically for sending get well cards to those struggling with different forms of cancer. The colors of the paper pack are lavender (all cancers awareness), lime green (lymphoma awareness), pink (breast cancer awareness), teal (ovarian cancer awareness), and peach (cervical cancer awareness). 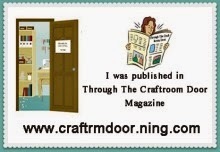 Take a peek at these products at the end of this post. Thank you so much for stopping by today, friends! I know that Julie needs our support now more than ever, so let's band together and show her that we are here for her! Your next stop on the hop is the lovely Ruza Rebel.